Cairo: Protesters demanding Egypt’s ruling generals hand over power beat back a new police raid to evict them from Cairo’s central Tahrir Square on Monday, witnesses said. The police fired tear gas and attacked a makeshift field hospital, while protesters broke up pavements to hurl the chunks of concrete at police. Tahrir Square was the major rallying point for protesters in Cairo when an 18-day uprising toppled Mubarak from three decades of power in February. With just a week before voting in the first free parliamentary election in decades, the confrontations in the capital Cairo and other cities raised worries about how smooth voting will be. Egyptians elect a new parliament in a staggered vote that starts on 28 November, but even when the assembly is picked, presidential powers remain with the army until a presidential poll, which may not happen until late 2012 or early 2013. Protesters want a much swifter transition. 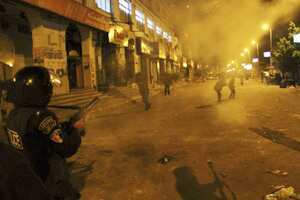 Teargas has rained down on demonstrators and police have beaten them with batons in a bid to end the protest. Angry protesters brandished spent shotgun cartridges and bullet casings on Sunday, although police denied using live rounds. Police backed by army officers fired salvoes of gas canisters and charged demonstrators in the square as darkness fell on Sunday, temporarily sending protesters fleeing. They burned down banners and Internet video clips, which could not be independently checked, showed police beating protesters with sticks, pulling them by the hair and, in one case, dumping what appeared to be a corpse on piles of rubbish. Demonstrators swiftly regrouped in sidestreets and returned to take control of the square overnight before police tried again to retake Tahrir after dawn. Field Marshal Mohamed Hussein Tantawi, Mubarak’s defence minister for two decades and who leads the army council, has become a target of protests. “The people want the toppling of the Field Marshal," protesters frequently chanted. “I don’t want Tantawi ... I am staying tonight," said Ayman Ramadan, a data entry employee, said early on Monday morning. State television said at least 10 people were killed on Sunday, raising the death toll since Saturday, when clashes erupted, to at least 12. Hundreds have been wounded. The demonstration that began on Friday was initially led by Islamists, angry at a bid by the army-backed cabinet to lay down principles for a new constitution that would have kept the army out of the control of a future civilian government. But since then, the protest has largely been driven by the same youthful activists who galvanised Egyptians to bring down Mubarak, putting national pride before religion. One of those groups, April 6 youth movement, told Egypt’s state news agency it would stay in Cairo’s Tahrir and continue sit-ins in other cities until its demands were met, including a call for a presidential vote no later than April. Other demands include replacing the current cabinet with a national salvation government and an immediate investigation into the clashes in Tahrir and trial of those implicated in it. Presidential candidate Hazem Salah Abu Ismail, an ultra-conservative Salafi Islamist, told protesters in Tahrir: “We are demanding as the minimum that power be handed over within six months." The army has denied any desire to cling onto power and says it will not let any violence delay the parliamentary poll. It insists it can ensure security during the vote. “We are all insisting on having the election on time -- the government, parties and the Supreme Council of the Armed Forces," cabinet spokesman Mohamed Hegazy told Reuters. But analysts say a surge in violence in voting, a common feature of elections in Mubarak’s era of rigged polls, could undermine the assembly’s legitimacy if the result is questioned and deepen public frustration at the army’s handling of the transition. Presidential hopefuls Mohamed ElBaradei and Abdallah al-Ashaal denounced violence against protesters and called for a national salvation government, state news agency MENA said. The European Union’s foreign policy chief, Catherine Ashton, urged Egypt’s interim authority to halt the violence. “I urge calm and restraint and condemn the use of violence in the strongest terms," she said. Liberal groups are dismayed by the military trials of thousands of civilians and the army’s failure to scrap a hated emergency law. Islamists eyeing a strong showing in the next parliament suspect the army wants to curtail their influence. Analysts say Islamists could win 40% of parliamentary seats, with a big portion going to the Muslim Brotherhood, the most organised Islamist group. But analysts say predicting a result is tricky, given the vast number of new parties and voices in Egypt’s political landscape.